OMAHA, Nebraska, June 4, 2012 (ENS) – Two Texas pipeline companies have agreed to pay more than $1 million to the U.S. government to settle claims from three natural gasoline pipeline spills, the U.S. Justice Department and Environmental Protection Agency have announced. Enterprise Products Partners LP and its subsidiary, Mid-America Pipeline Co. LLC, have agreed to pay the $1.042 million civil penalty to settle violations of the Clean Water Act related to three natural gasoline pipeline spills in Iowa, Kansas and Nebraska. Natural gasoline is not natural gas but an unrefined lightweight liquid, clear to light amber in color. As part of a consent decree lodged May 29 in U.S. District Court in Omaha, the companies also agreed to upgrade their reporting of spills and spend at least $200,000 to identify and prevent external threats to the pipeline involved in the spills. MAPCO owns and Enterprise operates the 2,769-mile West Red Pipeline, which transports liquid fuels between Conway, Kansas, and Pine Bend, Minnesota. A March 29, 2007, rupture near Yutan, Nebraska, which caused the discharge of 1,669 barrels of natural gasoline into an unnamed ditch and Otoe Creek. An April 23, 2010, rupture near Niles, Kansas, which caused the discharge of 1,760 barrels of natural gasoline into an unnamed ditch, Cole Creek, Buckeye Creek and the Solomon River. An August 13, 2011, rupture near Onawa, Iowa, which caused the discharge of 818 barrels of natural gasoline into the Missouri River. “Pipeline ruptures and resulting spills can cause significant harm to the environment, so it is essential that pipeline owners and operators abide by federal laws intended to protect our land and waters,” said Ignacia Moreno, assistant attorney general for the Environment and Natural Resources Division of the U.S. Department of Justice. “This agreement will put into place important measures to prevent future spills and identify potential safety threats along MAPCO’s West Red Pipeline,” she said. “More than 20,000 miles of pipeline carrying oil and petroleum products cross the states of Iowa, Kansas, Missouri and Nebraska in EPA’s Region 7,” said Environmental Protection Agency Regional Administrator Karl Brooks. “A frequent cause of pipeline breaks is the action of third parties during farming and excavation. This settlement requires the defendants to honor a schedule of pipeline inspections on the ground and from the air, and reach out to local agencies, contractors and excavators to make sure they are more fully aware of pipeline locations and depths,” said Brooks. Enterprise Products spokesman Rick Rainey told the Associated Press that all three spills covered by the settlement were caused by factors beyond the company’s control. Rainey said the 2007 spill in Nebraska and the 2010 spill in Kansas were caused by people accidentally digging up the pipeline. The Enterprise website provides contact information and urges people to call the company before excavating. 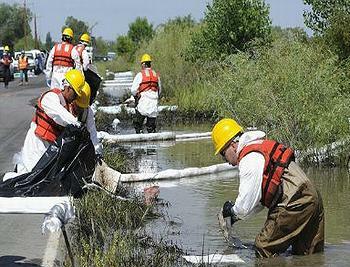 In October 2009, MAPCO filed a federal lawsuit against Wilson Excavating over the pipeline rupture in Yutan, Nebraska. The 2011 Iowa spill occurred after flooding along the Missouri River washed away support for the pipeline, Rainey said. In addition to proactive inspections and outreach efforts, the settlement also requires MAPCO and Enterprise to spend $200,000 to relocate, cover, lower or replace pipeline segments; install new remote shutoff valves; install new physical protections such as fences or concrete barriers; and install other new equipment, structures or systems to prevent spills from reaching navigable waters of the United States.